This Felipe Gregorio Fusion Torpedo is another of the cigars in my daily smokes humidor. Dollar for dollar I think these are a fantastic value, that's why I smoke them. Right out of the cellophane you can see this is a nice cigar. The toothy Habano wrapper is rolled on with near seamless care and the body is packed firmly full length with no hard or soft areas. The cold aroma is mainly earthy as is flavor from the free cold draw. Once the stick is burning there are flavor notes of nuts and coffee that mix with the earth. The nice burn line leaves behind a soft gray ash that normally holds on to near the half way point, if you try. Most of the time this is a driving cigar so I bump the ash early to avoid a burnt leg and a mess. In the final third a bit more flavor develops with some brown sugar and leather. Overall this is a solid cigar with it's construction and flavor profile and I will keep buying the Felipe Gregorio Fusion when ever I can find a deal. This is one the five cigars that are in my daily smoking humidor. This cigar comes wrapped in a Spanish cedar band covering the bottom half of the stick and I am sure that accounts for much of the spicy cedar cold aroma and cold draw. Mixed with the spicy cedar there is a bit of peat and apple to the nose. The vintage 2002 has nice overall construction, I would call it rugged, but it's nice. It starts with a thick, heavy wrapper that shows a medium amount of tooth and oil as well as a few medium sized veins. The even burn produces a tight looking white ash that normally falls around the 1/3 mark. A test of the retro hale produces notes of sour apple that is pretty stout. The flavor mix isn't really complex, but I think it's pretty good and consistent from stick to stick. I found notes of spicy cedar, coffee, brown sugar, earth, plus some leather and charcoal on the finish. Three weeks ago I had never heard of dissident cigars, let alone smoked either of there two brands. I saw a picture of a Soap Box cigar on Facebook and thought to myself "that looks interesting", so I researched the cigar, then the company and here we are. Today, here I sit reflecting on this fine cigar, thinking about just what to say in this review to really do it justice. I do know that I was blown away by the flavor and long complex finish of the dissident BLOC B_A. There are some interesting things that should be pointed out about this cigar. You will see from the photo, the band is in the 8-bit video game style of graphics, the band at the foot has "Start Here" printed on it and inside the main band is printed "Continue? Yes, No" with the yes being highlighted. Seeing this made me chuckle a bit and if there really were a button there I would push yes! Oh and I nearly forgot, since the name is BLOC and the graphics are in block style, it is box-pressed; Of course, it couldn't be any other way. I am not going to post it all here, but go to dissidentcigars.com and read about what they are trying to accomplish with their lines. The overall appearance of the BLOC was top notch and so was the construction. Feeling down the body there were no hard or soft areas, the dark Habano wrapper was rolled on seamless and contained very fine veins. There was a medium amount of tooth to the oily wrapper and it had a nice aroma of cocoa. Checking the foot for cold aromas there were notes of spicy cedar and cocoa to the nose. Once the end was clipped the cold draw was free and had the same flavors found from the foot. After toasting and lighting the cigar, the first few medium body draws had flavors of mild black pepper, cocoa and molasses while leaving a lingering espresso aftertaste. The pepper subsided rather quickly being replaced by a bit of oak. A retro hale produced a mix of black tea and black pepper. As the burn progressed past the first third it left behind a soft gray ash, surprisingly it held on nearly to the top band, and a nice oily band on the wrapper. Around the half way point the flavors shifted to a mix of creamy mocha and coffee with a hint of sweet tree fruit. In the final third is where I thought the BLOC B_A showed its' strengths by producing a nice long finish that was simply outstanding! I say this because the flavors in the final third shifted with nearly every draw. I experienced notes of cream, mocha, cocoa, semi sweet chocolate, brown sugar, molasses and charcoal either alone or in combination with others. Super, super finish! I liked the flavor mix so well that I gave it 20 points and this cigar is in the running for cigar of the year. I paired this with a Sumatran coffee and my normal diet Pepsi. 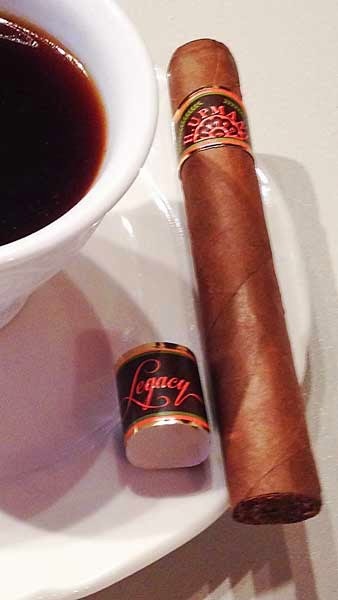 The coffee brought out the bolder flavors in the cigar while the soda enhanced the natural sweetness in the cigar. If you are interested in this BLOC cigar, and you should be, there is a list of retailers carrying dissident cigars on their site. I picked this Gurkha Cigars Cellar Reserve Koi up during one of my weekly trips to Cigar Train to smoke on the way home. Once the cigar was free from the cellophane, I could see it was a well constructed short and stubby cigar. It was tightly packed from head to foot, the oily wrapper contained only very fine veins and it had a seamless wrapper. Putting the cigar to my nose I could smell notes of spicy cedar and brown sugar. The cold draw spicy and had notes of cedar and brown sugar, with a touch of oak on top. Since this was a perfecto, lighting the cigar was a breeze. The first few draws yielded nearly the same mild flavor mix as the cold draw and left a nice bit of spice lingering on the palate. As the burn moved toward the middle, it left behind a medium gray flaky ash with a wavy burn line, but not to worry, the burn line didn't get bad enough to need correction and it straightened itself out before reaching the nub. There was also a nice amount of oil that developed just ahead the burn line. Near the middle the flavors shifted to a mix of mild peat moss and earth. Into the second half the strength had built into more of a medium to full and the flavors shifted again to a bit of hay, buttery sweet cream and leather. The hay only lasted for a bit leaving a nice finish of sweet cream and leather. Like I said, at 4 x 58 it's a short and stubby little devil, but it sure had big flavors. I just wish it would have been a larger size so the enjoyment would have lasted a bit longer. Just by looking at the wrapper I knew this H.Upmann Legacy Toro was going to be a great stick. Construction of the cigar from head to foot was flawless, except removing the lower band created a pinhead sized hole the wrapper. The cigar was firmly packed full length, the oily wrapper was put on with near seamless care and contained only the finest of veins. Checking the aroma from the foot there were notes of spicy cedar and brown sugar, to the nose and these same flavors were found from the cold draw once the end was clipped. After toasting and lighting the cigar I was rewarded with a large mouthful of mild, cedar and brown sugar flavored smoke. As the burn progressed through the first third slight flavors of raisin and oak joined in. This cigar was very slow burning and the sharp burn line left behind a soft light gray ash that fell right at the 1/3 mark. There was also an nice oil line that developed on the wrapper just above the burn. Testing the retro hale I found it to be mild and earthy. Around the mid point a bit of earth and mild black pepper entered into the mix and the strength began building more in the medium range. The pepper didn't last long and it was replaced by notes of leather to finish the cigar off. This was a nice mild cigar, it was slow burning, had mellow flavors and produced a large volume of smoke. The strength never did get above medium and it was a nice before breakfast cigar. I paired this with both diet Pepsi and coffee and it didn't matter which one I sipped on the flavors of the cigar remained constant. You can find these on Famous-Smoke.com price at $7.00 per single or just $125.99 for a box of 20. As a fan of Sumatran coffee, I am excited to try this Sumatra Red Badger from Milton Made Coffee. I guess those weren't really quick details since there were quite a few. Looking at the whole Sumatra Red Badger through the bag, most of the beans have a spot or two of oil on the outside. As the bag was opened there were strong notes of coffee and cocoa, these same aromas, but stronger, filled the room once the beans were ground. After the ground beans were immersed in hot water the aromas changed to pleasant mix of cocoa and lemon grass. After steeping and being cupped, there was a nice oil sheen sitting on the coffee and there were aroma notes again of coffee and cocoa. With the first few sips, the coffee was bright, crisp and bold with a semi sweet finish. It took several sips to sort out the flavors, but the main flavor nuances were a chocolaty, woody, earthy mix of smooth flavors, that left a slight tartness of lemon grass on the palate. As always, the second cup was bolder, but even smoother, with more of a syrup like consistency chewy finish. The notes of earth and wood were a bit more prominent in this second cup. This Sumatra Red Badger was paired with an H.Upmann Legacy cigar. The cigar had great mild flavor mix and with the coffee made a great breakfast combination. The smoothness of the cigar may have enhanced the smoothness of the coffee, but bold coffee with a mild cigar hit the spot before the Sun came up today! Again Milton Made Coffee sets the bar. I give the Sumatra Red Badger a 5 out of 5 star rating! Currently the 1502 Ruby Perfecto is only available at 1502 lounges and this sample was provided by Global Premium Cigars. Can this new vitola deliver the same great flavors as the robusto? Let's find out. Like every other cigar from 1502, construction was top-of-the-line. Feeling down the body there were no soft spots, and the oily, toothy, Ecuadorian maduro wrapper was rolled on near seamlessly creating a very nice looking cigar. I clipped the head and a touch off the foot to test the cold aromas and flavors. From the foot I found notes of cocoa and spicy cedar. Testing the cold draw, it was free and contained flavor notes of cocoa, espresso and a touch of black pepper. Since the foot was so small it only took a couple seconds to toast and light. The first few draws were a mild, smooth and delicious mix of the cocoa, espresso and black pepper, the same mix that I found testing the cold draw. The first thing that really caught my attention was the amount of smoke this cigar produced; had I been indoors it would have already filled a small room. The smoke had an enjoyable sweet oak aroma. I tested the flavors with a retro hale and found mild black pepper mixed with espresso. Deeper into the first third the strength began to increase more into the medium body ranges and notes of leather and molasses took over as the main flavors. The burn left behind a flaky gray ash and a wavy burn line. As the burn reached the mid section of the cigar the cocoa and espresso flavors came back pushing away the pepper. Just as the burn was beginning to touch the band, the ash finally gave way and fell. At this point the flavors shifted for the final time to a mix of molasses, cocoa, charcoal and espresso creating that "burnt mocha" flavor, that I look for in maduro cigars. This flavor mix created a nice long finish to the nub. This was another great cigar from 1502 and if you have not tried one yet, in my opinion you are really missing out! I would like to thank Global Premium Cigars for giving me the opportunity to smoke and review this cigar. To start out, I would like to thank Kevin Newman from the Ventura Cigar Company for providing samples to make this a more comprehensive review. After reviewing the Psyko Seven a couple weeks back, Kevin and I had a conversation about the Psyko and the Project805. The end result, Kevin sent me some samples of the Project805 Robusto and a sample of the Andullo tobacco used in the filler blend. Price: $6.80 Sample provided by Ventura Cigar Co.
After removing the Project805 from the cellophane the first thing I checked were the cold aromas. From the foot I found notes of tree fruit, toast and leather. Once the initial flavor notes were out of the way I inspected the body. 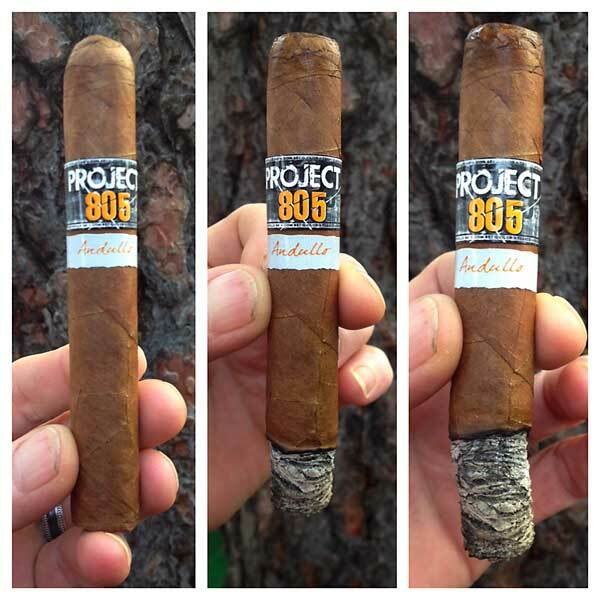 I found the Project805 to be well packed full length with no hard or soft patches and the sturdy Corojo wrapper contained fairly small veins. Once the cigar was clipped, the cold draw again had notes of fruit and toast with a lingering toast aftertaste. My initial thoughts were that the Project805 must contain a dark fire cured leaf inside, but more about that later. After toasting and lighting the Project805, the first two draws were sharp blasts red pepper. Once those two were out of the way, I could taste a more pleasant mix of leather and smoky tobacco. This mix continued for a few puffs then some earth followed by sweet anise showed up to finish out the first third. Around the mid section the smokiness and leather became the main flavors again. In the final third I could taste some oak for a bit, but it shifted back to the smoky tobacco and leather to create a nice long finish. The flavor mix did shift quite often between the flavors I just mentioned but the smokiness and leather was always present, plus just enough red pepper to let you taste it. I normally don't like red pepper at all in a cigar, but this was mild, it didn't burn my tongue at all, and I thought it added to the smoking experience. As the cigar burned it left a sharp burn line and a medium gray striped ash that held on until the cigar's mid point. 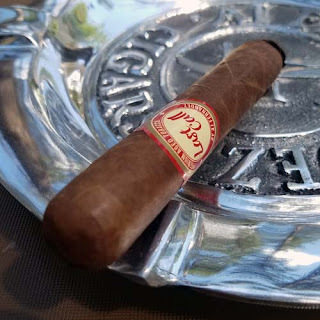 In reflection, I thought this cigar had amazing flavors, the Andullo tobacco creates some nice flavors that make it a very flavorful cigar that is enjoyable, but not overpowering. The Project805 does have great flavor, but it still tastes like a cigar, not a flavored stick of tobacco. The Ventura Cigar Company did a great job blending this cigar and I plan on having a few of these in my humidor all the time! Below is a photo of the cured Andullo tobacco. To the touch it's hard and feels a bit like beef jerky. To the nose it has notes of sweet anise, smokey tobacco, and believe it or not, a touch of worcestershire sauce. I think the cured Andullo leaf has a fantastic aroma. This is a sample of Sumatra I just happened upon by chance from a local roasting company here in Spokane, WA I don't get a chance to review much of the local fare, and I am pretty happy to find this coffee. Out of the bag the first thing I noticed was the lack of any exterior oils on the beans, however, this could be due to how it has been stored before it came to me. In the grinder the coarsely ground beans have a nice nutty, mocha aroma, the same aroma was present after the beans and water were added to the press. After steeping and pouring the first cup there was a slight oil sheen at the top and the same aromas of toast and mocha were present. The first sip from the cup was quite rewarding. There was no bitterness or bite present and the coffee had the flavor of slightly sweet fresh bread. I also to found this first cup to be crisp and smooth. Once the second cup was poured I found it to be a bit more on the chewy side, which is always the case when using a press and there was a touch of peanuts present with the bread. With the second cup there was a mildly bitter aftertaste on the palate, but overall it was still refreshing. This was my third attempt at smoking Gurkha Blue Steel cigar for the review and finally I was able to pull it off. The first two of these I tried smoking were rolled so tight at the shoulder that they were impossible to smoke--short of clipping them off below the shoulder. I've had draw problems with Gurkha's before but these were the worst I have ran into. So let's take a look at the good points about this Blue Steel! At first glance this is a great looking cigar. The oily, dark maduro wrapper with fine veins has plenty of tooth, it's rolled on seamlessly and it has floral and cocoa notes to the nose. The cold draw on this cigar was firm but free and had flavors of semi sweet chocolate, toast and earth. Once the cigar was burning it produced loads of slightly nutty smoke and the initial flavors were tree fruit, cocoa, toast and earth. As the burn progressed it left behind a firm light gray ash that held for about two inches before falling on my leg. A nice oil line developed just above the razor sharp burn line and a few other flavors started entering in to the mix. By the time this medium to full bodied cigar was down to the nub, I had experienced notes of molasses, brown sugar, charcoal, barn yard, mocha and oak. I would have to call the Gurkha Blue Steel a classic maduro cigar. This stick had a great wrapper, nice burn and great flavors. Gurhka only produced around 50,000 of these cigars so supplies could be getting scarce. Had the first two sticks not had draw problems I would have rated this cigar in the 93-95 range, but since they did I have to ding the score a bit. I have two of these left and I really hope they don't have draw problems so I can enjoy more of this good tasting cigar. After unwrapping and cutting the cigar, I found cold flavor notes from the foot of rich tobacco, cedar and black tea. Testing the draw, it was free and had flavor notes of tobacco and cedar. Once the cigar was burning the most predominate flavor was earth mixed with a bit of brown sugar. As the razor sharp burn progressed it left behind a firm white ash and other flavors slowly developed into the mix. I found notes of molasses, hay, wet straw, oak and peat. In the first third the strength was mild, but by the final third it had developed more into the medium body range. This was a nice cigar. It had good flavors, great burn and a nice ash. I would purchase this cigar again. (Miami, FL) January 14, 2014—Toraño Family Cigar Co., makers of some of the finest cigars in the world, proudly announce the “Blends from the Vault Tour”. The much anticipated Blends from the Vault tour will kick off its 2014 run on February 5, 2014 at Three J’s Cigar Store in Davie, Fl. in what will be the first of approximately 40 events spread across the nation. The tour will feature the Toraño Family’s highly acclaimed Vault A-008 which received a 92 rating from Cigar Aficionado, the recently released Vault D-042 and, the Limited Edition Vault Gold VLE100, which will only be available at these exclusive events. Charlie Toraño, President of Toraño Family Cigar Company, wished to introduce an extremely limited edition third blend from the storied Toraño Vault series for this special tour. Blends from the Vault originate from the family’s cigar “blend book” which was started by Carlos Toraño, Sr. in 1982. The blend book, which is now over 30 years old, has a record of every blend concept the Toraño family has ever worked on. Amongst the blends recorded there are many which the family has released over the years, as well as some blends which were deemed to have tremendous potential, but fell short of the family’s high expectations. In 2011, Charlie Toraño revisited the blend book and discovered an intriguing, yet unreleased blend, Liga A-008. After a slight modification to the blend, the Liga A-008 was released to the public and so well received by critics that another forgotten blend from the book was modified, the Liga D-042. The Vault Gold VLE100 cigars are yet from another unreleased blend from the blend book, also modified to complement the Vault Series perfectly. The Blends from the Vault cigar series gives consumers a unique glimpse into the Toraño family’s celebrated history. A leader in the cigar industry, Toraño Family Cigar Company is a four generation company currently based in Miami, FL. It enjoys a rich heritage and history in tobacco growing and manufacturing. For more information: www.torano.com. Please also follow Toraño on Face book: Toraño A family Cigar Company or on Twitter: @TORANOFAMCIGARS. Creativas Group Inc. provides public relations and marketing counsel to South Florida-based businesses, nationally recognized special events and leading non-profit organizations. For more information, please log onto www.creativasgroup.com or email info@creativasgroup.com. Photographs and interviews are available by request. The Punch Bareknuckle is another of those cigars that have been on my to smoke list for some time and I finally picked up a couple last week. So here's my take on this cigar. The first thing I noticed about this cigar once it was unwrapped was the dark oily wrapper. Feeling the body, the cigar was packed firm, but not hard, and the thick wrapper contained only very small veins and a medium amount of tooth. Overall construction Punch Bareknuckle was top of the line. To the nose there were strong notes of coffee and cocoa from the foot and once the end was cut, the free cold draw produced flavors of spicy cedar mixed with chocolate. After the end was toasted and burning the first draw filled my mouth with a large volume medium body of mocha and rich tobacco flavored, chewy smoke. As the burn progressed I other flavors of earth, oak, coffee and mild black pepper. Around the mid point there was also a bit of barnyard and sweet molasses. All of these flavors came and went creating an enjoyable cigar. The flavor mix of this cigar was so good I was thinking it would make my top ten this year, that is until the final third. In the final third, the strength moved more into the full range and the punch hit. All I could taste was tongue burning red pepper which I don't like at all. I continued on for another inch or so, but it subsided. The burn on the Punch Bareknuckle was razor sharp leaving behind a soft looking gray stripped ash. with a nice oil line just above. I was a bit disappointed when the ash fell after the first inch, but oh well, you don't smoke the ash. I have another of these in the humidor and I will see if some age helps the red pepper dissipate, but even if it doesn't the first two thirds of the cigar was fantastic! If I pick up more of these at a later date I will try it as a robusto and see if that makes a difference in the flavor mix. To begin, I smoke quite a few torpedo's so the Double Guillotine cutters that I have used in the past did a fine job. Problems began when my V cutter and punches all became dull and started damaging wrappers so I switched to the Double Guillotines. I cut fairly shallow on parejos shaped cigars and lately many of the cigars I have been smoking are rolled pretty tight. These other cutters have been skipping over the filler and just cutting the end cap. 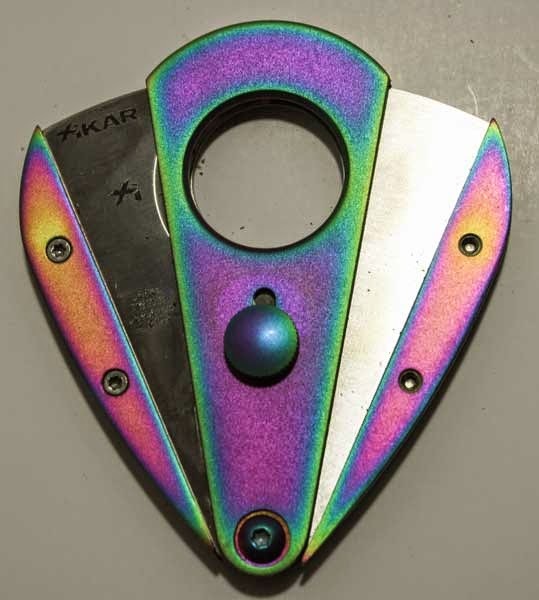 When I pulled this Xikar Xi3 Titanium Spectra Cutter out of the box, the first thing I checked, other than how cool it looked, was the blade sharpness and it was sharp. Actually it was much sharper than any of my other cutters, in fact it is sharp enough to cut where I want to cut a cigar with no problems at. Consequently I have stopped using all my other cutters and use the Xi3 all the time now. There are a couple of other benefits too. Xikar offers a lifetime warranty. Even if this cutter gets dull they will repair or replace it if I send it back. Next, when I registered this cutter on the Xikar.com website I learned that they will send me a leather sheath for it. How good is that? It doesn't get much better than a lifetime warranty and a free sheath! Well done Xikar. 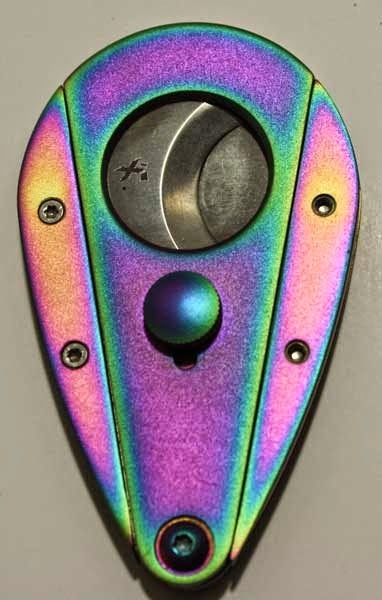 I am giving this Xi3 Titanium Spectra Cutter a 10 out of 10 rating! The Rouge Tyrant by East India Trading Company is one of those cigars I just had to have because of the cool looking band. From a visual point of view the Rogue Tyrant is a great cigar. Inspecting the cigar it had a nice heavy habano wrapper with finer veins than one would expect plus it has seamless construction. Really the only downside to this cigar was its softness. The body was soft from head to foot, so soft in fact I had it nearly smashed flat by the time I smoked it to a nub. I had clipped the end and checked aromas before leaving the store and found cold aroma was a mix of coffee and chocolate, while the free cold draw had notes of earth and spicy cedar. Once the foot was toasted and burning the cigar produced loads of nutty scented smoke. In the first third the flavor notes were nuts, mocha and earth. At the mid point there was a short blast of medium black pepper mixed with wheat straw, but it only lasted for a few draws. This was a great tasting cigar for the first two thirds but the final third was the best. I found notes of sweet cream, charcoal, chocolate and espresso that jumped around creating a nice long finish. The burn on the Rogue Tyrant was a bit wavy, but fine, and a nice bit of oil developed on the wrapper ahead of the burn line. For being a loosely packed cigar I was surprised the light gray ash held on until the main band. Had the band been removed prior to smoking it probably would have held on even longer. Reading at Gurkha.com it states the Rouge line is box pressed, I wondered about this as I smoked the cigar because it was an oval shape. Again this was a great tasting, good burning cigar with some minor construction problems. Again I am fortunate enough to receive a pre-release sample of the 1502 Nicaragua, from Global Premium Cigars, distributed by House of Emilio. Unlike the other cigars offered by 1502 Cigars, this stick is a Nicaraguan Puro and contains tobaccos from the four principal tobacco regions in Nicaragua: Jalapa, Esteli, Condega and Ometepe Island. Viewing the information about this cigar on the Global Premium Cigars website there is not much information on the specific tobaccos or blends. However, according to Enrique Sanchez "It's the Puro that I created for my son, so that he never forgets his roots, 100% Nicaraguan". That's pretty neat in my opinion! Being a curious type of guy, I asked Leonel Poveda, from Global Premium Cigars, if the 1502 Nicaragua will be released with the same white band as the sample and he replied, "The label will be the white label. This cigar is not a 'Gem' like the other three 1502, this one is the Nica roots, tobacco from the motherland for your daily enjoyment! So, if like Enrique, you may enjoy an Emerald for breakfast, a Ruby after lunch, and a Black Gold after a great and hearty dinner. I love my 'Gems' but enjoy a Nicaragua all day long, any day!". At a glance, the construction of this cigar, like all 1502 cigars, is top notch. The natural wrapper was rolled on with near seamless perfection and wraps down over the foot allowing just a small peek of filler tobaccos inside. The wrapper itself contains only the finest of veins and is light brown, claro, in color. Through the nose I found notes of rich tobacco and sweet tea from the body and foot. Once the end was clipped the firm but free cold draw yielded flavors of sweet tea and spicy cedar. Putting a match to the foot, the cigar was burning with ease. In the first third the most prevalent flavors were sweet tea, earth, cream, oak, spicy cedar, tree fruit and mild pepper. Right at the cigar's mid point there was an area with heavy floral notes. Into the final third the spice and sweet cream developed as the prominent flavors but nearly every draw had hints of the other flavors found in the first third. This complex flavor mix created an enjoyable long satisfying finish. As the cigar burned it left behind a clean burn line, with an oil ring in the wrapper and a soft light gray ash that fell right at the 1/3 mark. Overall I think this is a fantastic medium body cigar. It had top notch construction, a great burn and a complex flavor mix that kept me guessing with each draw. I look forward to smoking many more of these in the future and I wish to thank Global Premium Cigars for giving me the opportunity to review this pre-release 1520 Nicaragua. 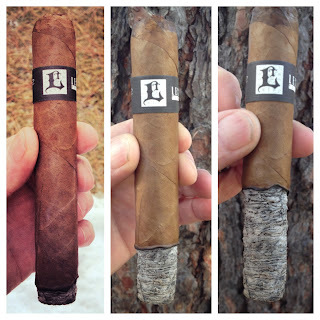 Once I'd finished smoking the Sam Leccia Black Gordo, I went back and compared notes with the previous robusto review. I was surprised to find out just how close these two cigars were in regards to flavor, strength and burn. The Black gordo also had top of the line construction. Visual inspection of the cigar showed the wrapper contained only smaller veins and the cold aroma had sweet flavor notes of smoke, nuts and toast. Checking the body of the cigar, it was packed hard, almost rock hard, but once the end was clipped the draw was perfect. Testing the cold draw I found the same flavors mix as the cold aroma plus some added brown sugar and each draw left a lingering sweetness. After toasting the foot and lighting the cigar, the first couple of puffs yielded medium strength black pepper, brown sugar, smoked almonds (that's as close as I can be on a flavor reference) and toast. After the first few puffs the black pepper disappeared leaving a tasty flavor mix that remained constant, but the strength did increase, until the final third where the flavor shifted to a mix of brown sugar, oak, smoked almonds, leather and earth just past the mid point. As this slow burning Sam Leccia Black Gordo, it started in the medium range for strength and moved into the medium/full range at the nub. As you can see in the second photo as the burn progressed it left behind a medium gray ash and a clean burn line. The ash held on until a strong gust of wind blew it off a few minutes after the last photo was taken. Overall I found the gordo a great size for this blend! The 1502 Ruby Corona is a pre-release sample sent to me by Global Premium Cigars. I am excited to try this new vitola since the Ruby robusto was my 2013 cigar of the year. Visually inspecting the cigar I found the construction to be top notch. The Ecuadorian maduro wrapper was rolled on tightly and contained only a few small veins. Feeling down the body, it was firm with no hard or soft patches. Testing the cold aromas from the body and foot I found notes of chocolate and spicy cedar. Once the end was clipped the very free cold draw yielded just about the same flavor notes. I don't smoke many coronas so I was a bit surprised at how easy this cigar toasted and started burning. Once it was lit the first mouthful of smoke had notes of spicy cedar, light black pepper and a hint of citrus. Around the one inch mark the pepper faded and the more familiar notes of coffee and chocolate dominated the mix. When the burn passed the 1/3 mark the flaky dark gray ash gave up and fell to the ground. At the mid point the flavor mix changed to a mix of earth and mild red pepper lasting about an inch until the chocolate came back mixed with some sweet molasses that lasted to the nub. Overall the 1502 Ruby Corona was another great stick with solid construction, that smoked well and had good flavors. Like it's bigger brother, it held it's box pressed shape down to the nub. I still favor the robusto in this blend over the corona, but if you favor coronas this will be a great stick for you! I would like to thank Global Premium Cigars for giving me the opportunity to smoke and review this cigar! This Cuba Aliados Corojo cigar is one of the reasons I first started this site. It is a quality cigar that can be picked up at a good price from several retailers around the web. No it doesn't have a fancy band and it doesn't have knock-your-socks-off-sit-you-back-in-your-chair flavor that makes you says WOW to yourself but it's a quality cigar, with good flavor, a nice looking ash and a great burn. I don't have an unlimited cigar budget, so I look for deals all the time and this cigar fits the bill quite well. The Cuba Aliados Corojo Piramide has a good construction with a toothy corojo wrapper. As the cigar burned with a razor sharp burn line it left behind a firm white ash that held on until the mid point. The most prominent flavors were, mild black pepper, earth, oak, molasses, damp peat and touch mild red pepper. Like I said this cigar was nothing special, it was just a good tasting, solid smoke. I could smoke a couple of these Cuba Aliados cigars every day and not break the bank. I read all the time in posts, "Life is to short to smoke cheap cigars". My philosophy deviates from that a bit. I always say "life is to short to smoke bad cigars"! If you read of my reviews you will find that price doesn't not always equal taste. I would like to thank my friend Johnny of Milton Made Coffee for bombing me with these and a few other sticks around the holidays. This has been a highly anticipated cigar for me to smoke and review. After a long wait the time is finally here! I missed the first arrivals of the Kentucky Fire Cured at Cigar Train and had to wait another week to pick one up. There happened to be one sitting in the box with no cellophane so I check the cold aroma before grabbing mine. That first cigar had a very strong BBQ aroma to it smelling exactly like the Sweet Baby Rays BBQ sauce I use at home. This created a bit of apprehension on my part toward the flavors mix of the Kentucky Fire Cured cigar, but when I unwrapped mine at home the hickory was no where near as pronounced. That made me pretty happy. Personally, I like cigars with toothy, heavy wrappers and the KFC really fit the bill. The wrapper was heavy, had surprisingly small veins for the thickness and contained a great deal of tooth. The maduro section above the ring was so toothy it felt like fine sand paper. Feeling down the body of the cigar it was firm the entire length and actually rock hard above the ring but once the end was clipped it didn't hamper the cold draw. Testing the cold draw for flavors I found mainly notes of hickory. Once the cigar was burning, the first flavors were light black pepper and a semi sweet mixture of hickory, brown sugar and earth. As the cigar burned it produced a nice volume of smoke from both ends that smelled a bit like a camp fire. The clean burn line left behind a light gray flakey ash the held on just a bit past the mid point. In the second half the brown sugar changed to molasses combining again with some mild black pepper and smoky oak to give the KFC a nice long finish. Overall the Kentucky Fire Cured was a very good cigar and a nice change of pace. It never burned hot or had any tongue burning pepper and it took well over an hour to smoke. Like always I paired this cigar with diet Pepsi and think a nice bold coffee would have been a better choice. If you like them smoky and sweet this will be a great cigar! Last night while at Cigar Train I grabbed a couple Psyko Seven toros on a whim for something to smoke on the drive home. Let me tell you, it was a great decision. 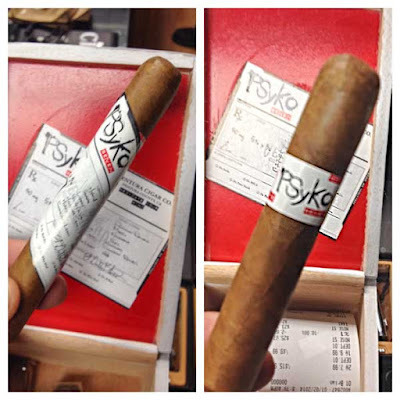 I wondered why Ventura Cigar Company named this cigar the Psyko, but buy the time I had finished the cigar I had a couple of my own ideas why. First, it was a crazy good cigar. Second it drove me nearly Psyko trying to determine all the flavors I experienced. The Ventura Cigar web site says, "medicate your mind with the Psyko Seven". I'm not sure my mind was medicated, but my mind and palate were both stimulated! From the box, (white on the outside, blood red on the inside), to the double band (the large outer band is prescription pad that has a Rx on it), to the flavor profile, everything about this cigar is a bit unique. The larger outer band came off with no damage to the wrapper giving me a chance to examine the Dominican hybrid wrapper and the rest of the cigar. The wrapper was rolled on neatly containing only the finest of veins and the cigar was firm, not hard, the entire length. Checking the cold aroma is something I always do and this is what started to drive me Psyko with this cigar. My initial impression of the cold aroma told me there was a dark fire cured leaf hidden inside, but after several more attempts I came to the conclusion it was more of a black tea aroma. Once I had clipped the end cap, the free cold draw sent me for the same loop. At first I thought it was tree fruit, but after several more tries I decided it was more of a sweet tea taste. I am still not 100% sure. I set the foot on fire and then the real craziness began. In the first half I found flavors that reminded me of, sweet red dessert wine, rich Turkish blend tobacco and a light touch of oak. Around the mid point I knocked the firm gray ash since I was driving and a few more flavors developed. I experienced a splash of anise, a dash of mild black pepper and a bit of earth, with the wine and tobacco notes still present. In the last third the cigar finished with an constantly changing mix of tea, wine, sweet tea, tobacco, earth and mild pepper giving this medium body cigar a nice long satisfying and tasty finish. Overall, this was a fantastic cigar and had a flavor mix that I just loved. The construction, burn and presentation of this cigar were all top notch and I'll be smoking many more this year. I've never given a 20 for flavor, but this cigar earned it!! The Psyko Seven is going to make a great addition to my smoking rotation, you should give one a try. This is the first cigar I have purchased in any type of stay fresh packaging. The "G Fresh" packing used by Drew Estate seems to have done the job well since the wrapper on the Acid Blondie show no signs of being dry or brittle. When I opened the package it was pretty easy to tell what this cigar had been infused with--or at least what I thought it had been infused with; patchouli oil and lots of it. I never have been a fan of patchouli oil and probably never will be. Initially this was a huge minus for this cigar, but I inspected it, tested the draw, lit it up and smoked it anyway. Feeling down the body of the blondie I found it to be on the soft side, but consistent the entire length. I used the table top cutter at Cigar Train to make a V cut, removing the small pig tail and a portion of the cap. The draw was free and easy with heavy notes of patchouli oil. I toasted the foot and lit it up. The first draws had a flavor mix of sweet light corn syrup and patchouli oil. These remained the prominent flavors until right at the mid point where two or three blasts of mild red pepper hit my tongue. Well the pepper wasn't to bad and once it had passed the flavor mix change to patchouli oil mixed with toasted marshmallow and remained like that down to the nub. There may have been a touch of coffee here and there too, but it was very mild. The cigar burned straight and clean entire length and the draw was great the entire time.